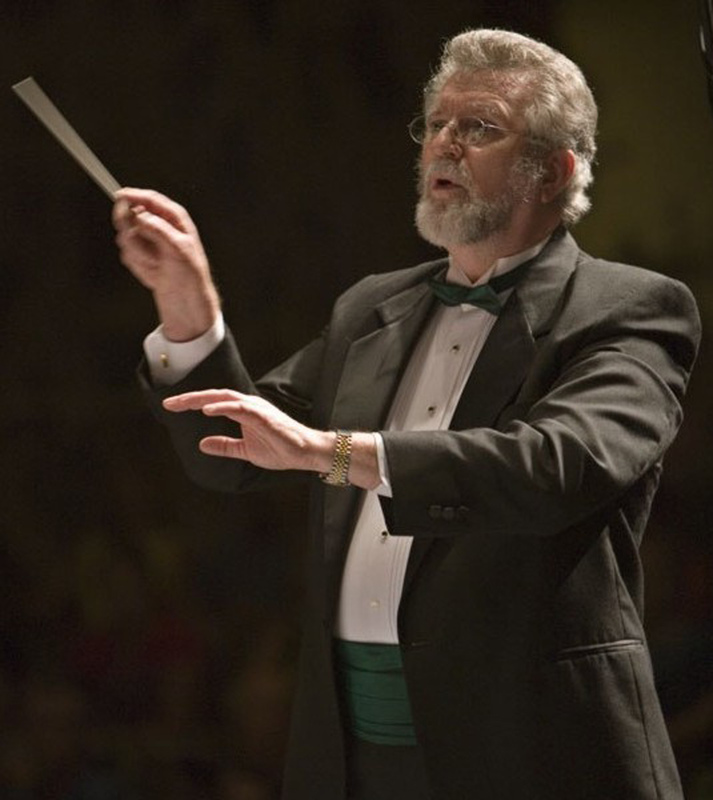 I never intended to become a choral conductor; yet in 1996, at the age of 57, I found myself to be one. Now how could that happen? I came from a singing family–we were always singing around the house. From around the age of 12 I’ve always sung in a choir, beginning in a church choir, then in high school and college, singing in the choir and ensembles. Later I graduated to a large, auditioned community chorus. But I was always just one of the tenors with no thoughts of conducting. Until that day. . . .
After retiring and moving to Volcano, Hawaii, I joined the newly-formed Volcano Festival Chorus, a group of about 20 singers created to sing the Advent/Christmas portion of Handel’s Messiah at the Volcano Arts Center’s annual Christmas program. It was led by Camille Almy, who had retired and moved to Volcano after a long career in opera and choral music on Oahu. Over the next couple of years we became close friends, and when she decided to move to California to be near one of her daughters because of health issues, she asked me to take over for her. At first I declined, not wanting to be a conductor. We then had a meeting to discuss the list of people who fit the criteria for the job: 1) know something about choral music; 2) have the time to do the job; and 3) be willing to work for nothing. After about an hour of discussion, we had come up with only one name–and so I became the new volunteer director of the Volcano Festival Chorus, a position I held from 1996 to 2011. We had two concerts each year, a holiday themed concert in December and another concert in May. My first concert in December of 1996 was a marathon–twenty-three songs, including the 13-minute Fantasia on Christmas Carols by Vaughan Williams. Our first spring concert was music of Cole Porter, followed by music of George Gershwin. Later concerts ranged from Disney movie music to Beatles tunes to grand opera. I had no fear. The Volcano Festival Chorus is now part of Kilauea Drama and Entertainment Network, and is conducted by Roch Jones. I never intended to become the conductor of the Hilo Community Chorus; yet, early in the twenty- first century, I found myself in that position. For several decades the community folk were in a union with the chorus at the University of Hawaii at Hilo, but when Ken Staton returned as professor/choral director after a long hiatus, I volunteered to help him in any way he needed. He soon found that there was a large influx of students who wanted to sing in the choir–about 130 of them–and there was not a room large enough to hold all of them and the community folk, so he asked me to rehearse them while he rehearsed the students and we would put them all together for the last few weeks (when the stage of the theater was available), and then they would all sing together in concert. This worked pretty well for a few years, and then Ken retired. By this time we were weaning ourselves from the University Chorus and we quickly formed a Board of Directors and were off and running as the Hilo Community Chorus with me as the volunteer musical director. While the two groups were still together in the spring of 2007, Ken decided to present Karl Jenkins’ Requiem. Meanwhile, in New York, a new group was forming (Distinguished Concerts International New York) to present concerts at major concert halls, and Karl Jenkins was on the board of directors. They were looking for American choruses who had presented his Requiem. They found us through the publisher and invited us to sing with them at Carnegie Hall. About forty of us (students and community folk) went to New York in January of 2008 for that performance, along with other choruses from around the world. Since then, a number of us have been back several times for performances at Carnegie Hall and Lincoln Center, which included more music of Karl Jenkins, Orff’s Carmina Burana, and Handel’s Messiah. We have a standing invitation to sing with them any time they perform with mass choruses. Chorus members have also traveled to China, South America, and Turkey for DCINY performances. Our first full concert was in the fall of 2008–a concert of Spirituals and Appalachian Gospel Songs. It was memorable to me because I had Whipple surgery for pancreatic cancer in early August of that year, and got out of the hospital about a month before the concert. I conducted all of the spirituals except one, and Melanie Oldfather conducted the gospel songs. The one spiritual that Melanie conducted was “Ain’t Got Time to Die,” which I sang as a solo with choral accompaniment. Later concerts included an all-Vivaldi concert (conducted by my old choral conductor, Barry Hemphill), Karl Jenkins’ Stabat Mater (conducted by Jonathan Griffith, principal conductor of DCINY), Messiah, Parts II and III, and a 9/11 commemorative concert featuring music of John Rutter and Karl Jenkins. Of course the group always presents a holiday-themed concert in December. I still serve as their volunteer conductor, and in May of 2014 the Chorus presented a concert featuring Haydn’s Lord Nelson Mass and Laudidsen’s Lux Aeterna. Since 2007 the Chorus has also co-sponsored an annual Messiah sing along at the Church of the Holy Cross in Hilo. The Chorus sits in the audience and serves as section leaders, soloists are chosen for each performance, and I serve as conductor. I never intended to become a church choir director, yet in 2012 when our organist/choirmaster left Christ Lutheran Church and our new organist didn’t really want to conduct the choir, I volunteered to become choir director. That year we presented the choir’s first cantata, Joseph M. Martin’s Season of Praise. In December of 2013 the choir combined with the chorus to sing Martin’s new cantata, Appalachian Winter, with a ‘bluegrass style” consort, both in concert with the Hilo Community Chorus and in church service, with some of the HCC singers. I never intended to be a choral conductor, yet I truly believe that I am now doing what I am supposed to be doing at this stage of my life: conducting a community chorus and a church choir. I wouldn’t want to do anything else. As to why I would want to be a volunteer conductor, I have often wondered why myself until I recently had a conversation with my 83-year-old brother. He has been a professional steel guitar player in East Texas for nigh on to 60 years. I asked him if he was still playing, and he stated that he and a few of the boys still played every Friday night at nearby nursing homes. When I asked if they paid him, he said, “No…but I get to play.” So the answer came to me in that conversation: I do it because I still get to play.